The best way to honour the illustrious Ghanaian, who honoured Ghana at the global stage with his work in Soft X-ray spectroscopy; is to make real his vision to leapfrog Africa's development through a holistic investment in Science and Technology. 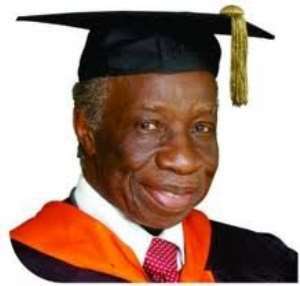 The Director-General of the Ghana Atomic Energy Commission (GAEC) says Professor Francis Ampenyin Allotey, who became the doyen of Africa's Mathematical physicists, utterly believed that it is imperative to transform Africa through industrialisation; thus not compromising the requisite investments in Science and Technology. 'He was a strong advocate for the teaching and learning of Science and Mathematics; this passion reflected in everything he did!' Prof. Benjamin Jabez Nyarko, said of the genius, as President Nana Addo Dankwa Akufo-Addo leads the nation to bid him an eternal farewell on Friday, February 23. 'Science was extremely important to him because he saw it as an essential means of meeting society's need for food, water, transport and communication, energy, good environment, health care, shelter, safety and alleviation of poverty,' Prof Nyarko explains. Prof. Allotey passed on to eternity on November 2, 2017, at the ripe age of 85. He became a world authority and an instant fame with his work on Soft X-Ray Spectroscopy, which established the principle widely known as the "Allotey Formalism", for which he received the Prince Philip Gold Medal Award in 1973. For GAEC, whose board he chaired from 1993 to 2000, he has left his legacy in a number of significant edifices and academic programmes. His chairmanship was preceded with his distinguished service in many different capacities from 1973, as the Chairman of the GAEC Management Committee, under the National Redemption Council (NRC); and also as the Chairman of the Ghana Research Reactor Committee. His appointment was to help revive the defunct Reactor Project, which was halted for political reasons. 'GAEC benefited immensely from Prof's international stature and networking, among which is the Commission's collaboration with the Argon National Laboratory (ANL) USA, International Centre for Theoretical Physics (ICTP) and Nuclear Science and Technology Institutes worldwide,' he states. Prof. Allotey, who served as a member of the Board of Governors of the International Atomic Energy Agency (IAEA) on several occasions, championed the cause, which led to the establishment of the infrastructure for managing cancers in Ghana. In 1995, according to the GAEC boss, Prof. Allotey, with the then First Lady of Ghana, Nana Konadu Agyeman Rawlings, and the then Director General of GAEC, travelled to Vienna to present to the IAEA, a Technical Cooperation request for Ghana to be assisted to meet her health-care needs in Radiation Oncology. Prof. Nyarko says this led to the establishment of the two National Centres for Radiotherapy and Nuclear Medicine (NCRNM) at Korle-Bu Teaching Hospital (KBTH) and Komfo Anokye Teaching Hospital (KATH) in 1998 and 2003, respectively. The cooperation, he says, also included the provision of radiotherapy and nuclear medicine equipment, plus 36 months training of Ghanaian radiation oncologists and medical physicists to manage the centres. Again, Prof. Nyarko says, in the late 1990s, Prof. Allotey successfully negotiated with the IAEC's Technical Cooperation Department in Vienna to also approve for Ghana, a sandwich fellowship programme that enabled qualified Ghanaian PhD candidates to undertake part of their research studies in a remote advanced institution where the necessary research gadgets are available. He was also instrumental in promulgating laws and policies, which facilitated the nuclear agenda, notable among them is the PNDC Law 308 of 1993, which empowered the Commission to establish Institutes. Another worthy one was the LI, which established the Radiation Protection Board for monitoring Ghana's telecommunication masts. Prof. Nyarko also describes him as having been 'a very friendly and strikingly humble person', explaining that, he had known Prof. Allotey as his lecturer at the now Kwame Nkrumah University of Science and Technology (KNUST). 'I must say that this was my first interaction with him. He was my lecturer and a very talented tutor, who made the course seem very easy to us. 'Further to that, when I was appointed as a Research Scientist in GAEC, he was then the Board Chairman. I must say his contribution to GAEC is colossal.